Rakhi is a festival when siblings bond. Everyone follows ritual of sisters tieing rakhis to brothers and giving gifts but its not only about brothers receiving gifts. Many brothers send return gifts to their sisters on Raksha Bandhan. Siblings who stay apart due to study or work reasons send gifts on such occasions to their siblings. Since Rakhi is just around the corner, we bet thr brothers are wondering what they can gift their sisters. Gifting a girl is not as easy because they are very selective and have their preferences and mind set on what they want usually. 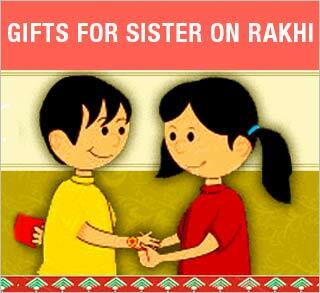 You surely cant be a mind reader but we can help you with a few options 5 popular gifts for Sisters on Rakhi. · Jewelry : Since jewelry and women go hand in hand , we are sure she will be delighted to receive a jewelry set or a pretty diamond pendant as a Rakhi gift. Many websites sell jewelry online and the variety goes endless. If your sisteris elder and married, you can opt for diamond or gold jewelry. If she likes changing and matching her jewelry everyday you can select from kundan and other fashion jewelry. · Personalized gifts : Every girl is emotional and loves it when people express their emotions and make them feel special. How about getting a lovely photo of you and your sister printed on a mug or a wall clock? Adding a personalized touch to gifting will always make your sister beam with happiness. · Gift Certifictaes: Girls can be complicated at times and extremely selective. When you have ruled out all options and cant decide what to gift your sister on Rakhi, you always have a backup of gift certificates. You can always give her a gift certificate for her favourite store/brand or food joint. · Gift an experience: Every girl loves being pampered and what better than gifting her a spa voucher or a visit to the salon. You can help her rejuvenate from the routine life and give her a wonderful break. Alternatively , if your sister is adventourous , you can also gift her a experience for various adventures. · Gift Hampers: Lastly customizing a gift hamper of her favourite gourmet items like rakhi sweets , specially her most loved chocolates will be an excellent idea. Also you can create hampers of beauty products form her favourite brands and add her favorite perfume to the gift basket. Gift baskets can have a mixture of anything that your sister loves. ← The Kitchen and Dining festival you’ve been waiting for!